No matter what operating system (or programs) that you use or how well they’re designed, now and then, you will come across applications that get stuck, where you cannot use the usual “Close” button to exit them. Although again, any OS comes with some sort of a task manager of its own, but if you’re not much of a tech savvy person, then “killing” or Terminating a hung-up app can still be a bit difficult. For instance, in Windows, whenever you want to terminate a stuck app, you first have to open the “Task manager”, and then you’ll have to locate its executable file from a list of currently running apps etc. So even if you find your way through all that hassle ;-), still, wouldn’t it be nice if we could “just terminate” an app, in a more user friendly approach? In that case, you might be interested in a small yet a very useful tool called “SuperF4”. Basically, using this tool, you can use your mouse to select the window of the hung up app, and then just click on it to terminate it!. *. It runs in the system tray (notification area), and can be set to automatically run on each system boot. *. You can use the keyboard shortcut of “Ctrl + Alt + F4” to terminate any window that’s currently selected, which doesn’t require your mouse. *. Or, as said before, you can press the other shortcut key (“Windows Logo Key + F4”) which should change your mouse pointer into a Skull (as shown in the first screenshot). Then simply locate the hung up app’s window using your mouse, and Click on it (left click), to terminate it!. 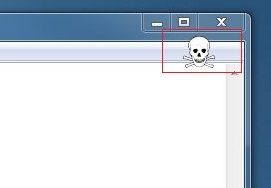 If you want to cancel the termination process, after pressing the shortcut keys, then simply press the “Right click” on your mouse anytime you want, and the “Skull” mark should vanish thus canceling the termination. *. Enable/Disable SuperF4 (disables the shortcuts). *. You can even use this app to terminate an application that runs in full screen (such as while playing a game) which can be really handy at times. It’s a completely free, open source tool and doesn’t consume a lot of your system resources for its own (while running in the system tray). However, please keep in mind that, terminating an app forceful (sometimes called: “force quit”) is not the same as closing it, as your unsaved data (if it’s a text editor containing text for instance) will be lost!. So use it with caution. If interested you can get it from this SuperF4 home page. Good luck.